Wabakimi Lake | Northern Wilderness Outfitters Ltd. This lake is located in the boundaries of the Wabakimi Provincial Park about 200 miles north of our airbase. 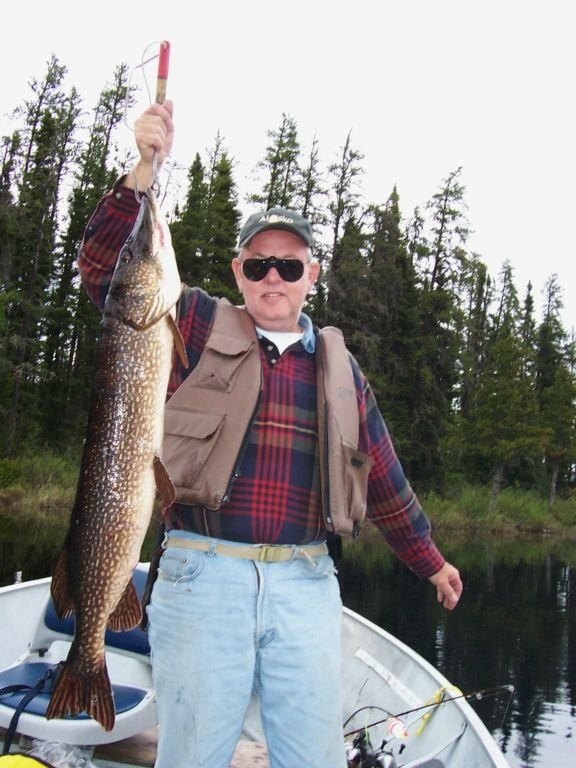 Great walleye fishing and a chance to catch trophy northerns make this lake a sure bet for the experienced fisherman. Wabakimi Lake is one of the largest lakes that we have an outpost cabin on. This lake stretches almost 20 miles from one end to the other and is about 4 miles across. We have added a large gazebo complete with hot showers and running water overlooking the prettiest view of all of Wabakimi Lake. Our comfortable log cabin can accommodate parties of 8-10 fishermen and comes complete with solar lights, large gas freezer & gas refrigerator, 6" innerspring mattresses on bunks, large gas barbecue grill, fish cooker, deep 16' Lund boats with padded swivel boat seats, Yamaha outboard motors, and a den in the cabin equipped with sofas and chairs where you can have a beer or pop and talk about your day’s fishing on Wabakimi Lake.